Enterprise-wide management of code groups, also known as value sets, will be a requirement for organizations that embrace forward-thinking initiatives such as Accountable Care, Health Information Exchange, and Population Health and Analytics. 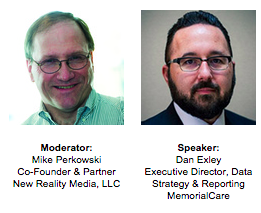 Our webinar, Code Groups - The Building Blocks for Your Analytic Initiatives, discusses the challenges with managing code groups withing today's healthcare environment, and how an enterprise terminiology management solution can provide a single source of terminiology truth. This webinar is hosted by Heatlh Data Management. Dan Exley, Executive Director, Data Strategy and Reporting at MemorialCare, discusses how code groups are used at MemorialCare for cohort identification in population health management and analytics, quality measures for Meaningful Use, and local measures for internal reporting and analytics programs. 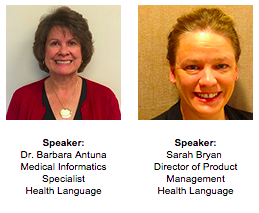 Dr. Barbara Antuna, Medical Informatics Specialist at Health Language, will review clinicial examples of code groups. Sarah Bryan will discuss the benefits of a code management solution and how to maintain a set of current, approved, up-to-date content for your organization. To access the webinar, please fill out the form to the right.